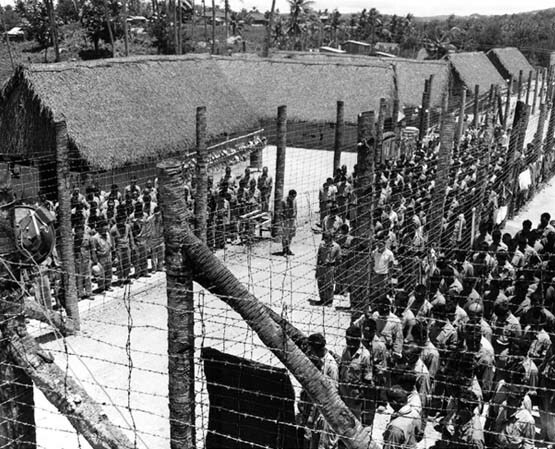 Japanese prisoners on Guam learn about the end of World War II. "It was on December 8, 1941," Tan Floren recalls. "We were in the church attending mass, okay, and one of my husbands nephews, he was working as a taxi at Piti. They called at Sumay; thats where some of the ships dock there. And theres a village." Okay, so it happened that my husbands nephew the taxi driver was driving his taxi around that day. When he heard that the Japanese bombed already at Sumay, he came honking his horn  we were at the church  to go and hide, because the Japanese already bombed Sumay." So all of us are coming out, you know, crying, and my brother is just four months old, so my sister and I, we have to pick up whatever we have, and we ran to the end of this village, and we hid. I thought that we'd hid while they continued bombing, so until it was very clear, and then everyone would be going back to their ranch. We hid under the big tree. This plane was going around, so we just grabbed whatever we had, and went there. When everything was calm, then we had to go back and get more clothes. Our ranch is not that far, so we just walked." The Japanese invasion of Guam, 10 December 1941. After Rogers, 1995. I think the Japanese just drove down. And in one of the houses where we lived a sensei, teacher stayed there. And another long big house, they made into a galley. Some of them Tan Floren says sternly. Family shelter in the concentration camps. 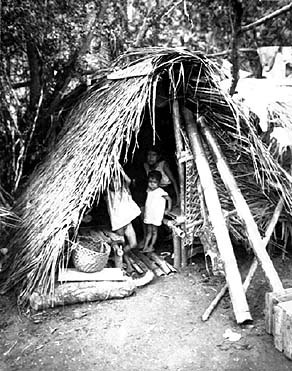 A lot of Chamorros were moved to camps in the center of the island towards the end of the war. The villagers chose our ranch to hide at, because its deep down. The Japanese thought, Its just coconut growing, but the people were there. And we were lucky, we had everything there. So we shared with the people. Even a lot of sugar cane, you know, the people were welcome to have it. And one evening, we were getting ready to move to another place, because we heard that the Japanese were going to end our lives that evening. "And it happened that the Americans were already on the other side, and there were two Guamanians with them. And we were thankful, because they had planned already to end our lives that evening. So we were just lucky that the Americans were just in time. After that they shot the Japanese." Bullet holes in the Anna Leon Guerrero home in Inarajan, from a aerial strafing. We walked all the night through, we just kept walking in the dark. We stopped maybe after about a couple miles, and thats where we stopped, and the American were just guarding us, the family. And then in the morning, we had to get up and continue walking to Merizo. We stopped there at the school, which is still there. Some of us went inside, and the rest were cooking, preparing rice. And then those whose rice was done, went inside. See, under that school, we made the fire there. "Then a couple of them got hit from the Japanese. My cousin, he got hit, but he was still living. Another one got hit on the face, cachorro, hit in here. 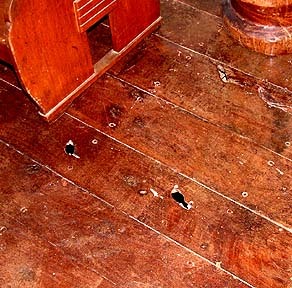 It happened that they didnt make it inside the schoolhouse, so they got hit with bullets, from the Japanese. And we were lucky we were inside already." "And then early in the morning we started walking again, to the beach. We stayed there, and then we started cooking again. So we continued walking, and there was the American helicopter, and it started throwing some food down, rations. We were so happy, we just pulled open the cans. There was jam, peanut butter, margarine. "We thanked God, thanked God it was over. We had the Americans back. They just came with rations, they didnt stay here. They went from one village to another, helping them, giving to them." 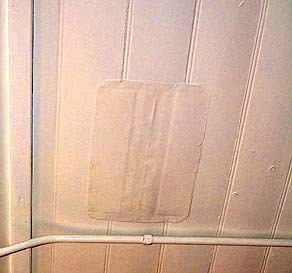 Patches in the ceiling like this one mark where the bullets came through. Inarajan was lucky to escape with fewer casualties than northern parts of the island. But one notable tragedy was the torture and execution of Father Dueñas.